This year, Oscar nominations will be announced on Thursday, January 10th. As a result, most of the corresponding guilds won’t have announced their picks by then, so I’m making predictions in advance without being able to take those into consideration. I’ll be offering detailed predictions in most of the major categories, saving some of the biggest categories for last. The rundown: It’s hardly as egregious as the Best Original Screenplay race, but it’s not helpful to wait for the Writers Guild of America to announce its picks on January 3rd since they’ve disqualified a handful of the films I’ve predicted above. It’s also worth noting that, last year, Oscar voters decided they weren’t keen on the scripts of two popular adaptations, “The Girl with the Dragon Tattoo” and “The Help,” and snubbed them here. 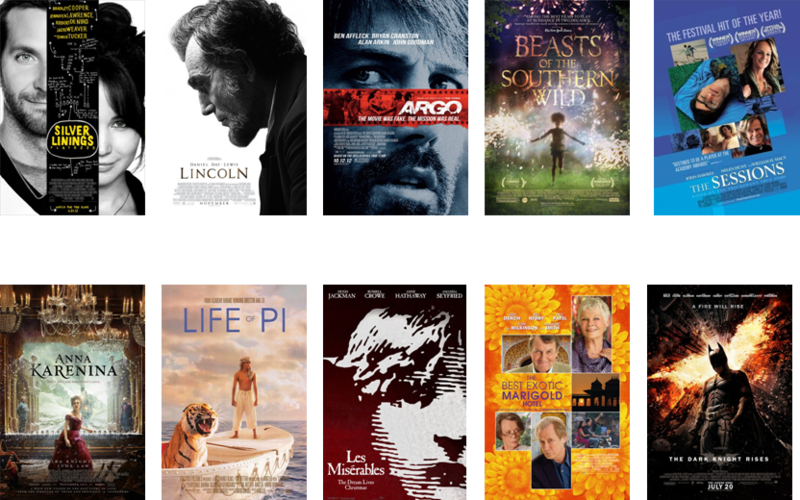 I’m doubtful that will prove problematic for Silver Linings Playbook, Argo and Lincoln, which will all vie for the win. It would make sense that breakthrough Beasts of the Southern Wild and surefire acting contender The Sessions would take the last two slots, but there are a few films that might disagree, namely Best Picture contenders Life of Pi and Les Miserables, whose scripts are far from the best parts of them, and literary adaptation Anna Karenina. This category often boasts a surprising snub or inclusion, so look for something strange. One possible crazy scenario: A nomination for This is 40 after “Knocked Up” got snubbed in the original race in 2007. Forecasted winner: I think Silver Linings Playbook is the frontrunner.